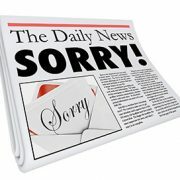 Saying ‘sorry’ for an incident, or issue does not ‘cut-it’ any more with affected stakeholders, or the media. Insincere apologies can make the situation even worse. Unfortunately, CEOs have fallen into contrite contrition in just using the words, but not fully recognising the importance of the sincerity element of them. They may seek to display remorse, but they have forgotten the power ‘sorry’ possesses for people directly affected by the issue to ‘move on’ and how it can earn forgiveness. Although saying ‘sorry’ was once the bane of all CEOs in a crisis because the legal departments would not allow it to be said for fear of admitting guilt, it now rolls off the tongue of executives whenever they feel it important to put pride aside and acknowledge a mistake. any lack of sincerity will result in the affected stakeholders feeling even more insulted, or harmed than before the artificial apology. CEOs of the Commonwealth Bank, VW, Mitsubishi, 7/11 stores, health care organisations have all apologised for being ‘caught out’ by issues in recent times for which their organisation was responsible. They fumble with words such as ‘values’, ‘ethics’, ‘principles’ – all used to take the high moral ground and deflect blame to others down the ranks. In most cases, they are following the ‘tried and true’ formula of crisis management – demonstrate ‘action’ after the ‘apology’ and follow it up with ‘taking responsibility’. They use it to (a) get the media off their backs (because it gives the media the grab: “I’m sorry”) and (b) to get the staff of the organisation to ‘ensure that the issue does not happen again’. It is called the ‘clear-up’ principle! Statement of regret – “I’m sorry that this issue has occurred. When using this formula if you don’t understand your stakeholders and their influence, you are wasting your time with general apologetic words. They become meaningless, especially in today’s age of ‘self’. The affected stakeholders are caught in cognitive dissonance – the disconnect between what is actually true and what they believe to be true. This causes frustration which can, in turn, manifest in not only disappointment, but also anger by those who feel cheated of the expected apology. This is best illustrated by the article entitled Apologies and Settlement in Court Review (Volume 45, Robbennolt) which found that statements of fault acceptance had more impact than apologies that simply stated sympathy without responsibility. RMKA has many years of experience in crisis and issues management around the world and the need to show the effectiveness of a sincere apology. It can provide you with the ability and supporting communication plans to not only say: “I can see you were harmed by our actions and that matters to me”, but also to understand the impact of this statement on your stakeholders and its acceptance by them. Would you like decency with that? Open a paper, turn on a TV, or click something that’s not bait and you will not have to turn far, wait long, or search hard to find a story about bad corporate behaviour. This is no better illustrated than by the recent Mossack Fonseca (Panama Papers) and Unaoil revelations (ably supported by a cast of local stories such as 7/Eleven, CommInsure, Wilson Security et al). So, is the surfacing of these revelations a deterioration in corporate culture and associated decline in ethical standards, or has this always been the way in which the spinning of the globe has been oiled and there has just been a rise in investigative reporting that has brought these issues out into the open? The answer is likely a mix of the two, however the naïve optimist in me would like to think that a fall in the standard of behaviour accounts for the majority of the stories that have been broken; as opposed to the alternative of low-standards having always existed out of view. Progressing on that basis, the question arises how do organisations ensure that their much vaunted corporate values are adhered to in the pursuit of shareholder value and returns? As we know, dollars (or perhaps what they represent) are very powerful things. Societal values are evolutionary in nature; by way of example I cite our acceptance of violence. It wasn’t so long ago that a punch up at the pub, though not encouraged, was accepted as a form of dispute resolution. Rightly, this is no longer the case. I therefore contend that organisations (be they government, corporate, or not-for-profit) need to have an adaptive system in place that educates their operational headcount about what is, and is not behaviourally acceptable. A one-off, tick box exercise to satisfy a checklist would not be sufficient given that the subject matter is undergoing continual metamorphoses. An enlightening parallel can be found in Bushido: The Soul of Japan, an explanation, if you will, written by Inazo Nitobe of the moral principles that Samurai were required or instructed to observe. The nature of the system was such that it was not a written code; rather it was a set of principles that were handed down organically (not unlike an oral history) either via word of mouth, or more impressively through deed. Interestingly, the paid fighter was naturally recruited from some fairly rough and ready personnel, it was through the generational application of the ‘unwritten moral code’ that Samurai came to be highly respected and seen as both the exemplars and guardians of the highest behavioural standards. It was a sorting of the wheat and chaff that conveyed enormous privilege and responsibility upon those within its ranks. It is possible to make the argument that our leaders are those now charged with passing down through word and deed the standards that are expected of their charges. These standards must be the living representation of ‘Value Statements’ and take into account the evolving expectations of society at large. As outlined by my colleagues Rob Masters (Contrite Contrition) and John Kananghinis (The Values Deficit) in this edition of Words and Insights society at large has had enough of hearing mealy mouthed platitudes laid at the foot of the most recent scandal. They want to see leaders who own the situation and the moment; leaders who embody their values statements through their actions; thereby laying the foundations and paving the way for the next generation of Samurai to follow them, and protect society’s behavioural standards. Inazo Nitobe (1862-1933) was born in Morioka, Iwate prefecture. After graduating from Sapporo Agricultural School, he went to the United States and Germany, where he studied agriculture and economics. On his return to Japan, he held various positions in education. From 1920 to 1926 he stayed in Geneva as Under-Secretary General of the League of Nations. After retiring from that post, he dedicated his life to peace. In 1933 he died in Banff, Canada. 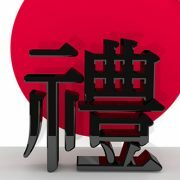 https://www.rmka.com.au/wp-content/uploads/2016/04/Japanese-Character-For-Respect_883x331.jpg 331 883 Angus Nicholls https://www.rmka.com.au/wp-content/uploads/2015/08/logo-300x132.png Angus Nicholls2016-04-29 12:49:182016-05-24 14:42:46Would you like decency with that? Creating value is the foundation stone of all business – to make or grow something, to provide a service, to improve daily life. This is the drive that results in surplus that can be traded and that has resulted in the interdependent global market in which we live. But there is more to what is ascribed a value. To paraphrase the Bible, “man does not live by bread alone”. We seek community, family, security and, for some, spiritual certainty and fulfilment. To achieve those ends in a civilised society we develop a set of beliefs, behaviours and ethics; a guide to our actions. We give those actions value, typically based on what we perceive the results to be either good or bad. Whilst there may be some cultural relativity, the core social values that are supposed to guide most of us are fairly common. Honesty, respect, tolerance and fairness are seen as essential social values. Their importance is attested to by the distress and anger caused when any, or a combination of those values are demonstrably absent in the actions of others. That is why we characterise such behaviour as criminal and seek to punish it and stamp it out. The modern global village is made up of individuals, states and corporations. In the developed world we expect the same social values to drive ethical and fair behaviour by all. We probably hold the non-individual actors (i.e. governments, corporations et al) to a higher standard, particularly given the disproportionate power they wield. Amongst those who state that with great power comes great responsibility are Winston Churchill, Theodore Roosevelt and Spiderman. That is where companies can find themselves in major trouble. In the drive to create monetary value, shareholder value and personal value for executives, they may forget the imperative to fit within the prevailing social values. That is, there is a Values Deficit TM. When that happens corporate reputation can, and usually is, destroyed. The 24-hour news cycle means that corporate misbehaviour will quickly gain broad exposure and, sadly, there is no shortage of examples. The result is that not only are organisations held to a higher standard, but the general disposition of most of the community towards them is inherently cynical. To gain and maintain trust, companies must align their values to community expectation and not only live those values, but also be seen to live them. When that does not happen we regularly hear complaints about a negative and poisonous corporate culture. Complaints that can justify the business equivalent of a lynching, or, at the very least, a pelting with rotten fruit. Not aligning with expected social values, yet still seeking to profit from the community that shares them, is the Values Deficit TM that can turn any business into a market pariah. 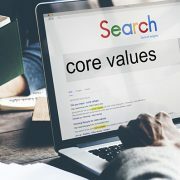 Any organisation that does not do a regular check of its values, the culture those create and assess if its actions and messages convey the desired values, runs a serious risk of drifting into a Values Deficit TM. The very nature of fast-paced competition can hasten that drift and create damage to reputation before it is even realised. RMKA are highly experienced in working with organisations to assess expressed and lived values and to communicate values alignment with the communities and stakeholders that support any organisation’s licence to operate.